Published on November 22, 2015 in Crime in T&T, Media, PNM and Politics. 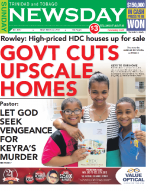 7 Comments Tags: HDC, Housing, Keith Rowley, Newsday, Politics, T&T Govt. The Housing Development Corporation (HDC) will no longer build high-end housing units. Instead, any future construction would be of more affordable units that meet the needs of the majority of applicants. Prime Minister Dr Keith Rowley made the statement at the new Chaconia Crescent development, Four Roads, Diego Martin, yesterday during his feature address at the distribution ceremony of 120 keys for units at Chaconia Crescent as well as for Greenvale Park in La Horquetta. He questioned whether the State could afford to give lower and middle- income persons multi-million dollar units that they could not afford. “Is that what you expect of the national housing programme? Is it your dream house of $4 million if you are a professional? Well the answer is that the taxpayers of Trinidad and Tobago cannot afford to provide to people who are looking for affordable housing, multi-million dollar homes,” he stated. Rowley said an example of these expensive units was the Victoria Keys development in Diego Martin. He noted a valuation stated that the cheapest unit was worth $1.6 million, while the top units were valued at $4.5 million. He said since the mortgage or rent would be out of reach for the average individual, he asked Housing Minister Marlene Mc Donald to send a note to Cabinet for the most expensive units to be sold on the open market. Government, he said, would take a few for its use instead of paying rent to private individuals, and the rest would be made available for rent-to-own through the National Housing Programme to those who could afford it. “I was advised that an additional $270 million was spent on those units. If you spend that kind of money on public sector units, what would we say to the taxpayers who paid the bill? So there will be no more of that. There will be no more three and four million dollar units being built by the HDC,” he said. Rowley went on to say that the housing programme was not in the Constitution so no one had a right to receive a home from the government. Instead he said persons had the right to access housing made available according to their needs as they are capable of contributing to the cost of the unit. He stressed that Government did not have the ability or resources to build homes for everyone who needs one. He said even if Government provided 8,000 per year, the HDC would not be able to satisfy the needs of the 200,000 applicants with more applications coming in every day. However, he made the point that, although there was a money shortage in the public sector, it was not so in the private sector. “Our banks are awash with cash and one of the best places to put that cash is in a national housing programme,” he said. Therefore, Government intends to take steps to encourage and engage the private sector to do more, offering incentives, so that housing construction would be funded by persons willing to pay a reasonable mortgage instead of the Treasury. Rowley noted that private development costs would include the land, construction, and then market value. However, with the housing policy subsidy, taxpayers absorb these costs. “We can’t do that as a sustainable policy. We need to change the policy so that the government does not put out that money (to build) and then have to carry that subsidy,” he said. Noting that the units at Chaconia Crescent cost about $1 million but were being made available at $650,000, Rowley said more and more people were “coming after” the subsidy. “What prevents a person with $40,000 per month from buying (a home) in the private sector if the private sector house is available? And why is it that a person earning $8,000, $9,000 per month would have to compete with a person earning $40,000 per month for subsidised housing?” he asked. “What happens in Trinidad and Tobago is that dotishness ascends above common sense… We can have a comprehensive national housing programme where… the government gets involved, the private sector entrepreneurs get involved, the private sector land owners get involved, the banks get involved and at the end of the day, the national effort will see to satisfying the needs of all those who aspire to owning a home,” he continued. He said Government would initially focus on completing unfinished developments before moving on to constructing new developments. This new HDC directive is the second major housing policy shift disclosed this week by Government which has also announced a cut the income ceiling for applicants from $45,000 a month to $25,000. Mac attack, the government should get out of the housing business. It have too many thieves, bobol and corruption occurring in that ministry. The minister herself is under suspect for questionable payments made in the past. Yes Alyssa, he is admitting what comes naturally for him – lies, deceit, thievery, bobol and corruption. He KNOWS what happened just two months ago and what better way to define that character, than to say “is not me, is the PNM”. managing the HDC. Lies, lies and more lies that is what they are about. The raising of the ceiling to $45,000 is no fluke. That was well calculated to reject some sectors of the community from owning those homes and at the same time welcoming others (favorable to the UNC) into those communities. Nothing they do can be taken for granted. Everything has to be taken “with a grain of salt”. I agree with what could have been a revised position by the Prime Minister about honouring HDC housing to those above the new income ceiling who were already allotted houses by the former PP government. I am also in agreement that Government should get out of the business of subsidising higher than average priced houses. They should not be subsidising luxuries. In this regard, all applicants where the household earns above $25,000 per month and have already been allotted houses under the last PP government should be facilitated within the various existing modest HDC housing schemes across the country. They should be accommodated, regardless of their higher than average income, in Clifton Hill Towers at St Paul Street, Port of Spain; Almond Court in Morvant; Apartments in George, Nelson and Duncan Streets; Beverly Hills, Laventille; Paradise Heights; Maloney Gardens, La Horquetta and other modest HDC projects. These communities could do with diversifying. In giving assistance (the key word is assistance) to people, regardless of their income, government has to be careful that our taxpayer’s funds are not being used to subsidise classism, elitism and racism. People should finance those ‘isms’ on their own. This HDC issue is ripe & stinks to high heavens! The UNC nakedly gave out & redesigned hdc houses to create hindu, indian enclaves in African dominated areas. Ironically, it is only under these conditions that many indians now want government housing. The idea of getting an apartment with no land & not having control over what you neighbour looks like has always been unattractive to the indian community ! however, the unc created whole new hindu & indian communities were created to entrech further, a divisive, racist communal mindset. Check it out…go to the hdc areas & you will see blocs of ‘unc supporters’ in one area!..how is that possible without corruption?All of a sudden, post 2010, massive hdc housing rackets started to emerge with members of the indian community, aligned with the UNC claiming to have ‘the hook up’ to get houses (crime watch). Over the past term, A number of vile unc talk show hosts coincidentally getting hdc units in the same, over priced, hindu, unc community …what a disgrace! I am baffled as to why & who is responsible for this precarious scenario ..only the UNC benefits from this as they have had ample time after losing the election, to shred the hell out of all evidence of wrongdoing! Have you noticed in the last 6 months or so ads for MOBILE SHREDDING machines?? DAY…since 2+ months have passed, i’m assuming that the PM simply hasn’t offered his list to President Carmona….yeah…i am sure this must be the case! This issue is just a warning of what is to come in T&T. Whether upscale or not home building is not the business of the government. NEVER WAS AND NEVER WILL BE. When my dad was a building contractor in the 1950s, Government then would promote the development of areas for building by companies who knew what they were doing…areas like Majouba Crossroads, Alice Glen, Victoria Gardens, Westmoorings North and SE etc. The Health Offices …one I know is still standing by the St James Police Station. I ask that my fellow bloggers go look at La Estancia Town homes in the Crystal Stream Diego Martin area back of RAINORAMA. ONE MAN BUILT THAT NOT A COMPANY – MY DAD. La Estancia was built without proper legislation back then in 1980. AND I SUPPOSE THE LEGISLATION HAS NOT BEEN COPIED FROM NORTH AMERICA YET. Anyway he and his brothers built many houses that I learnt from. After La Estancia two prominent bankers sat on their arse and out of the million dollar loan for the project made a killing. My dad made a meagre profit for his creativity and hard work moreso being a multi-tasker. But GOD WORKS IN HIS WAY NOT MAN’S WAYS. JUSTICE WILL COME. Nevertheless, I remember The IMF telling the NAR government on borrowings quote ” you are not the builders you are merely the support THE MAKE IT HAPPEN FACILITY – if you build you are begging for corruption if you get involved; instead you provide for, make your checks, enforce the laws and maintain the standards of practices and protect the people or citizenry of your country unquote. FOR EXAMPLE, YOU ARE THE PROVIDER OF WATER, ELECTRICITY, CIVIL WORKS LIKE ROADS, DRAINS, SEWERAGE THROUGH BONA FIDE CONTRACTORS etc. But we all know that governments do the opposite. A house construction process has a large number of sub contractors and every single one is faced with loads of corruption. Town and Country has become a huge waste of taxpayers monies. Numerous Afro folks learnt their building trades in the years gone by. They were honest and decent folks back then. Then the government dropped the ball since. White collar crime became a norm. LIKE THEIR SONS WHO TURNED TO DRUGS FOR QUICK MONEY THEY HAD NOTHING IN PLACE FOR THEM, THEY DIED OUT LIKE FLIES. GOVERNMENTS BECAME BUSY CLEANING OUT THE PUBLIC PURSE. O’HALLORAN AND PREVATT WERE FROM THAT ERA. And the housing costs got out of hand. My dad built the first houses in Westmoorings for $15000. In one year Prevatt thought this cost should be over $100,000. The Syrians took their cloth selling dollars and cashed in. And because they did not know and did not care (false papers became rampant then) the housing market like the vehicle markets in T&T soared out of government wannabe control. Our salaries were subjected to small increases comparatively. We were forced to work two and three jobs to make ends meet. The school system suffered. The public service employees in part resorted to grease hand. Lawyers and doctors increased their service fees by leaps and bounds. Governments bribed Union leaders. NIS was a scam. As professionals we were told that because of inflation our foreign counterparts had to earn two to three times more than us. And of course Mr Manning doubled his salary. We the middle class suffered the pains of our country taken away from us. As I would say we work the plants to keep them online while they work the businesses to keep their bank accounts overflowing. They bought equipment they knew nothing about. FALSE PAPERS WERE A NORM THEN. They bought out service contracts, maintenance outfits etc. And false papers worked but the country suffered. They even bought out the media so that there was no more a special correspondent informing the people of the mess they were creating. It is no surprise to me that Lebanon and Syria are changed countries today. THE SINS DO COME BACK TO HAUNT YOU – BEWARE.